Here’s the latest from Washington Dept. of Transport, regarding work on SR 14 that may affect your travels. o May 10-14, 9 a.m.-11 a.m.: Full CLOSURE of SR 14 for controlled blasting operations. o May 10-14, 6 a.m.-12 p.m.: Full CLOSURE of the Dog Mountain Trail and parking lot for safety precautions during controlled blasting operations. 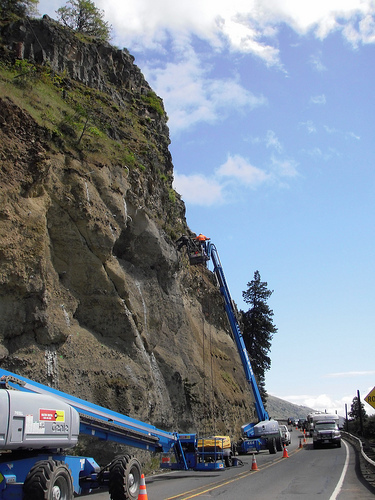 o May 10-14, 6:30 a.m.-9 a.m. and 11 a.m.-4 p.m.: When crews are not blasting, SR 14 will be reduced to a single lane, alternating directions with flaggers for rock removal and excavation work. Expect 20-minute delays. o May 8-14: During non-working hours, SR 14 will be reduced to a single lane, alternating directions with temporary traffic signal. Expect five-minute delays. o May 10-14, 7 a.m.-4 p.m.: SR 14 will be reduced to a single lane, alternating directions with flaggers for slope stabilization work. Drivers should expect 20-minute delays. Find this information on the Web . See more photos of project work on Flickr. I hear the whining all the time: If the damned media would just shut up about the economy, everything would be just fine. Check out the excellent piece in the Sunday NY Times, by its public editor, noting that despite numerous media warnings since 2000, we still drove ourselves into the ditch — banks printing bad paper, real-estate besotted buyers gorging on junk purchasing, and the government looking the other way. So, the Columbia Gorge Hotel closes, and Oregon Business magazine sends a reporter to ask, “Is it true the Hood River economy is in free fall?” Well, no. We set her straight. Just to share, and thanks to Jamel Badrieh at the Hood River County Chamber of Commerce for sending this along, the Chamber compiled a list of business closures, and business startups, in recent memory. It’s worth noting that, along with all the slower activity, there’s plenty of optimism out there. If this list has somehow missed YOUR business, or if you know of others, let us know. We’ll keep setting the record straight.